Ever wondered how intensive is green-Left indoctrination in the school system? One example: Australia to Z, a textbook for schoolchildren 12 and upwards, pushing a nakedly leftist agenda. The book is accompanied by the publisher’s massive and even more rabid “Teachers’ Notes” which seeks to get the kids out on the streets and campaigning on fashionable Left issues. Studying these tracts, I felt I was missing something. Then it hit me that the class environment must now be so palpably green/Left that teachers see no need even for a token effort to offer kids a counter-view. “On the one hand” — but there is no other hand. Yet on first principles, roughly half those kids’ parents vote conservative and their taxes pay the salaries of these supposedly non-partisan government workers. Australia to Z by is Swiss-born artist Armin Greder. The publisher Allen & Unwin touts it as ideal for secondary schoolers. The alphabet-based picture book comprises 32 pages and 40 key words by Greder. But the Teachers’ Notes by Queensland educationist Dr Robyn Sheahan-Bright run to 6000 words across 23 pages. Readers can download the .pdf by clicking here. Flip to Greder’s letter “R”. It’s “R for Rupert”, a snarling, eyeless and jowly caricature of the global media tycoon. Sheahan-Bright prompts kids, “What features are particularly pronounced in this portrait? What does this portrait suggest about the subject?” It seems that Murdoch derangement syndrome is fertilised early. In Orwell’s 1984, Oceanians each day have to watch a film of the Party’s enemies and then do a “Two Minute Hate”. Maybe that’s what teachers are enforcing about Murdoch. The book’s last page sets out the lyrics of Advance Australia Fair. But alongside, as Greder’s ironic juxtaposition, are drawings of a boat-people family greeted with a sign, “Go Back – We’re Full”; three bald, singleted yobbos chanting “Ozzy Ozzy Ozzy”; and another Ocker celebrating with a beer can. Sheahan-Bright views the page as “a salutary reminder that perhaps our founding values are not best served by the current [2015-16] political and cultural agenda.” Her verdict in the Teacher’s Notes is that Greder’s alphabet is “a disquieting and potent” and “profoundly significant” work. “This is an extremely important text with relevance for readers of all ages. It is also destined to become a contemporary classic,” she rhapsodises. Sheahan-Bright urges teachers to discuss with kids “offshore detention of illegal arrivals and refugees and whether that represents a humane policy”. Another topic suggested is National Sorry Day about European settlement, qua “invasion”. Kids are urged to become after-school activists supporting or protesting an issue selected by the teacher (one can imagine the choices – I don’t think protests against Gillian Triggs would be one of them). “Create a campaign with your class”, Sheahan-Bright urges teachers. But she adds in an arse-saving aside, “Note, though, that not all students may wish to become involved.” I imagine any such juvenile recalcitrants being herded into a ghetto for wrong-thinkers. Sheahan-Bright says a “concerned group” can do protests via public demonstrations, media advertising campaigns, billboards, and street graffiti. Kids are to research the legality of such modes – “sometimes graffiti artists become well-regarded and even famous for their protests”, she says. Internet sites she recommends include Chilout – Children out of Immigration Detention; “The Facts About ‘Boat People’ – the Government and media are Lying’; GetUp! ; and “The 25 Greatest Australian Graffiti Writers”. No site that she lists puts the case for secure borders. Alphabets are thought to be the province of young children, she writes, “but here the format has been used to engage with adult concepts and topics in a cryptic and powerful way”, referencing “our sometimes myopic foreign policy and our national insularity.” Greder includes drawings of tradies and laborers, whom Sheahan-Bright finds confronting. In S for Stubbies, for example, there’s a tradie in a bar in shorts, with a stubbie of beer. “What does the combined image suggest about our culture?” asks Sheahan-Bright, fishing for negatives. 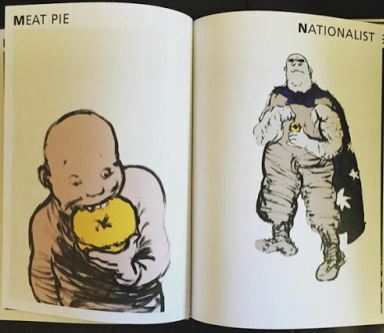 For “N for Nationist” the workaphobic artist has drawn a bald, fat, squint-eyed thug with beer can, draped in the Australian flag and wearing military boots. The preceding page, “M for Meat Pie” shows a juvenile version of the thug, about six years old, shoving a whole pie into his craw. As our teachers’ guider puts it, the adult thug is suggestive of “how this child may develop”. A pie is ominous food, apparently. “F for Footy” shows two thuggish players in a rugby tackle. “What does the body language suggest about the game of football?” asks Sheahan-Bright, clearly no fan of what she calls our “national obsession”. As “D for Digger”, Greder shows a Digger in a flag-draped coffin with a mourning wife and child, “potent symbols of war and nationhood”, says Sheahan-Bright. (My own take is that when Greder happened to be born, in 1942, his neutral Swiss homeland was waxing fat while Hitler plundered Europe). “X for Xmas” involves an Ocker in shorts and singlet, wearing plastic antlers, who is about to slaughter a turkey with a knife. 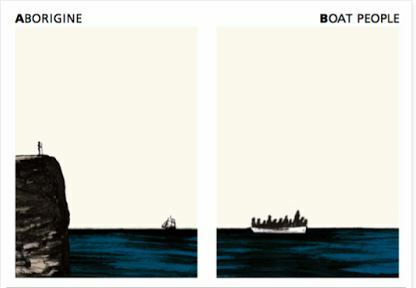 Sheahan-Bright wants kids to write a story interpreting the image, but hints at no countervailing Christian narrative. Stepping back a bit. and in all fairness, the 75-year-old Greder is an excellent stylist in charcoal, in the tradition of Germany’s Kaethe Kollwitz or our own Noel Counihan. He arrived in 1971 and taught tertiary-level art for 20 years. He has authored and illustrated many books – at least one involving a grant application – and he’s won prestigious awards. An earlier Greder book, published in Italy, was about what he calls the suffering of the Palestinian people at the hands of the Israeli government. He further glooms, “I am a pessimist, agreeing with the Spanish author Perez Reverte that the best of the twenty-first century is that we won’t be around when it ends. According to Sheahan-Bright, his alphabet book shows “how we as a culture might appear to those from other cultures”. This is a bit rich: Greder’s cultural qualifications as an immigrant date from 46 years ago. He now lives in Lima, Peru, from which remote outpost he opines on our Australian repugnancy. Dr Sheahan-Bright herself is an icon of the national and Queensland writers’ community, a former deputy chair of the Australian Society of Authors, former member of the Australia Council Literature Board and in 2012 was recipient of the Children’s Book Council’s Nan Chauncy Award for Outstanding Services to Children’s Literature. She’s vice-president (Australia) of the International Board on Books for Young People (IBBY) “which helps to build bridges to international understanding through children’s books.” Australia to Z would build a somewhat rickety bridge, methinks. Not content just with Armin Greder’s book, Sheahan-Bright recommends further alphabet-based agitprop to kids, namely “A is for Activism” and “ABC’s of Anarchy”. From those kids can learn that “L is for Liberation Front”, and “Z is for Zapatista”. My own thought: B is for Brainwashing. Tony Thomas’ book of essays, “That’s Debatable – 60 Years in Print” is available here. 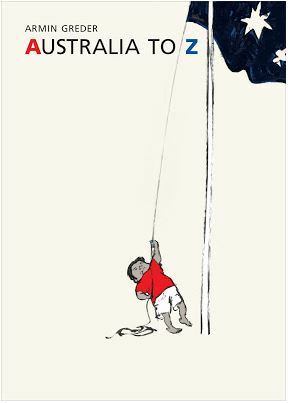 [i] However, the cover of the Kindle version I am using merely shows one child straining to hoist the flag, with no perjorative element. I don’t know if the publisher has changed the cover or opener to tone things down. This is outright treason! Reverse the situation, and all such people would end their days in the gulag for betraying the cause and rightly so. There is a saying in Hungary: “Repulsive is the bird that fouls its own nest.” So what of the ones who instruct young chicks to do just that? Well, after that rundown, and assuming it is an accurate portrayal of the book, it would appear to be such blatant political propaganda that it would create the conditions for a vigorous criticism of it. The most effective political propaganda is always subtle. I would argue that the image of the yob portrayed by Greder is pretty damn accurate in many parts of Sydney. As one who detests the welfare state, McMansions, and Muslim immigration, I’d always thought I was of the extreme right, but perhaps I’m just a snob. Not a hope, there is no market for this knowledge except amongst children from the Asian groups. This has been increasingly evident for 20 years and together with many other outcomes has resulted in most of the population unable to know the difference between Watts and Watt hours. Nor is this considered important. An example only, but when people are told of (mythical) batteries with 100MW with the term MWh following in brackets, they feel comforted. On Saturday a man turned up to hang my new curtains, install new tracks etc. We started talking to him; his was fairly roughly spoken, with dropped “g’s” and poor tense and he had tatts up both arms. It happens that he’s currently employed as a high school teacher as Careers Adviser and teaching Industrial Arts. 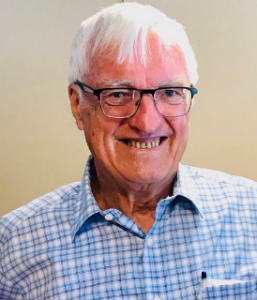 He’d been a Boilermaker in the mines in the Hunter Valley until he was laid off and then took advantage of a fast-track program to get him a degree because of some shortage or other. This he achieved 15 years ago, though I’m uncertain about the degree – perhaps a Bachelor of Teaching with IA. He has a permanent appointment and supplements his income on the weekends hanging curtains so that he and his wife can travel. He runs Careers Expos and the like in the local area very successfully and he takes students to meaningful excursions in the search for work and work-related requirements. But the reason I tell you this is because this man is a teacher and his command of English is not good, his appearance isn’t professional and this isn’t a good recommendation for NSW State Schools. Somewhere along the lines the system should have demanded that this man develop a professional mien for his serious work, though I don’t doubt he has the smarts when it comes to developing students’ understanding of being work ready. Perhaps there should be some other category apart from “Teacher” for these sorts of people because, in my experience, a teacher’s professional comportment and manner of speech is central to garnering the respect of students and peers. That and excellent teaching. I wonder what other profession would take anybody, put them through university and then accept them as a fully fledged member of that profession. Many students in the state system will already have limited exposure to professionals who provide role models on how to conduct themselves in the work place. When I went to conferences and in-servicing for English I was always impressed by the high standar ds of professionalism demonstrated by teachers from private schools – not that this meant they were all better teachers, per se. But their appearance and speech were already sufficient as to command respect and admiration. When Pythagoras, Aristotle and Hypatia were students, they had a piece of slate and a piece of chalk, if they were lucky. School was usually taught outside with large classes and no cons, mod or otherwise. Despite this, they learned mathematics, languages, music etc to a much more sophisticated standard than the average school leaver these days, who all have small classes, computers, and all mod cons. If Isaac Newton had been distracted with gender studies and safe school programmes I wonder if he would have even made it to Cambridge, let alone made any breakthroughs in mathematics, optics and physics. Too much of modern “education” is sophisticated baby-sitting with actual learning resulting from hard work avoided at all costs. There should be fewer teachers, fewer idiotic distractions and more emphasis on learning. It would cost a great deal less and produce better results from students capable of learning without wasting money on gimmicks designed to amuse and distract the remainder. Parents with responsibility who as a priority oversee their children’s education.! Yep spoken like a truely university educated elitist, or in Barnham’s terms ‘the managerial class’. The bloke can do a simple job like teaching and yet you elitists think he’s not good enough and needs social skills. The reason for your thinkshould be the subject of psychological examination and worthy of a real thesis. But basically I think you show You prefer the social veneer to real substance. I know what I’d prefer as a student expecting a job or the parent of a student wanting substance rather than some university educated halfwit who thinks the veener is more important than actual skills. This ‘professional teacher’ attitude is what has caused education standards and outcomes in this country to fall. The professional teacher attitude has a lot to do with classroom management. You are perfectly free to express equality in your own world with any man living or death in tee-shirt and thongs if you wish. I would hope for MORE for our young people than this lowest common denominator approach. We already have too much of that, or more than we can deal with. It is my experience kids adopt the mannerisms, expressions, and conduct themselves in the workplace according to the mannerisms, expressions. And behaviours of those they actually work with … as opposed to the airy fairy thinking that holds they behave according to how teachers have influenced them to behave in social and work situations. Spoken like a true Bolshevik with a chip on the shoulder. You would patronize young people with the bigotry of low expectations. Not for me, thanks. The other day I found myself seated at a concert alongside a younger acquaintance. He mentioned Brexit – UK being my alma mater. I said it was a wonderful prospect. “You’re the first person I have met who supports Brexit”, he replied. My friend paused for thought. “I suppose not.” he said. I wonder often what is taught in schools. Facts are out of fashion. Homework is mostly projects involving much internet searching but never for facts. All the EU treaties are open source, easily obtainable without charge. Hardly anyone read them, yet took to the streets, hurling insults at anyone supporting Brexit. Young people voted overwhelmingly for rejecting sovereign parliamentary democracy. And yet the budget for education continues to rise. Perhaps a cut of 50% is required to concentrate their minds of teachers on what is really important. I wonder how the hell did teachers set themselves up as a righteous guardian of the behaviours of our children? They are there to teach them how to read, write, comprehend, add subtract, multiply and divide. Then the advanced themes in secondary, leading to the more able to complete the senior school in advanced maths, sciences, language ote and English in prep for uni. Let’s cut all the other crap and get back to that. It was cheaper and effectively taught most kids to think for themselves.